June – September: The Barèges Valley mini-trek introduces you to sleeping in refuges in the mountains in a lovely setting, the Barèges valley and the Néouvielle Nature Reserve. 175€pp. June – October: Our flexible Gavarnie Balconies Trek can be from 1-7 nights and is perfect to discover the splendour of the Gavarnie Cirque in more than just a day walk. Approach from the north along the old Compostella path and soak up the big views. 95€ – 680 €pp. July – Sept: The Pyrenees National Park Trek gives you a full week in the French Pyrenees National Park. Varied and spectacular scenery taking in the major sites of the Central French Pyrenees. 735€pp (min 2P). 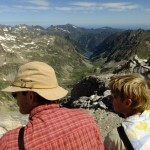 July – Sept: Our GR10 Cauterets – Pic du Midi trek is challenging walking with long days. The week takes in both the Cauterets-Gavarnie loop and the Néouvielle – Pic du Midi loop. 735€pp (min 2P). Pyrenees Discovery: Discover the best of the Pyrenees in a flexible and relaxed manner. Walking, excursions to the market and villages, a day trip to Pic du Midi, great food and wonderful scenery. At the end of the week you will have taken in three of the four Grand Sites of the Hautes-Pyrenees: Gavarnie, the Pont d’Espagne and the Pic du Midi. The fourth, Lourdes, can be visited either on your way in or out of the valley. Trip runs from 2P with half guiding and 4P with full guiding. Price: 975€pp, Grade: easy-moderate, Meet: Luz St Sauveur, Email: Sian. Dates: May – October. 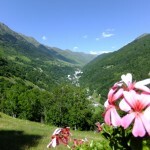 Gavarnie-Ordesa 3 Days, Price: 515€pp, Grade: moderate-difficult, Meet: Luz St Sauveur. Dates: 18 – 22 July (Thurs-Mon, CONFIRMED), 12 – 16 September (Thurs-Mon, CONFIRMED), 24-28 October (Thus-Mon) 2019. Four nights, three days trekking, two countries, one World Heritage Area. The Gavarnie Cirque in France and the Ordesa Canyon in Spain are two of the most spectacular sites in the Pyrenees, and are at the heart of the Mont Perdu World Heritage Area. This three day trek takes you through both, crossing the French-Spanish border in two different places; firstly over the highest pass on any of the trails to Compostelle (2200m), and secondly through the dramatic Brèche de Roland (2804m). Three Summits, Three Days, Price: 415€pp, Grade: challenging, Meet: Gavarnie. Dates: 1 – 5 Aug (CONFIRMED), 29 Aug – 2 Sept, 26 – 30 Sept (CONFIRMED), 10-14 Oct (CONFIRMED). 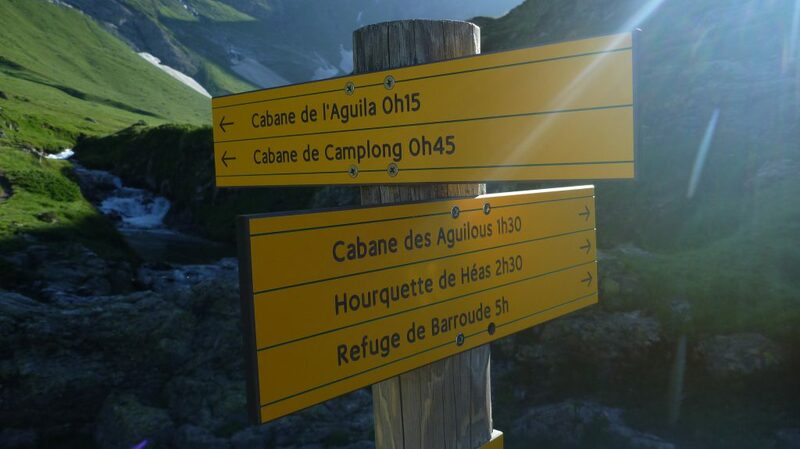 Explore three mighty Pyrenean peaks during a three-day, four night camping trip. You meet in Gavarnie and have three full, challenging days climbing a different peak each day. There are plenty to choose from, starting with the Taillon or the Casque via the Breche de Roland, the Petit Vignemale and the mighty Piméné with its spectacular view into all three glacial cirques and all the way down the valley. We provide the tents, you will eat meals in the refuge next to the camp ground, bring your own sleeping bag and mat. A fantastic way to be out in the mountain air and challenging your limits. 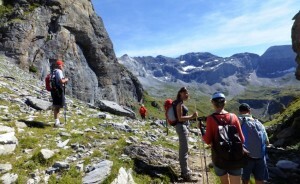 Ordesa – Gavarnie Trek, Price: 1010€pp, Grade: moderate-difficult, Meet: Lourdes. Dates: 31 Aug – 7 September 2019, 21 – 28 September (Sat-Sat) 2019. 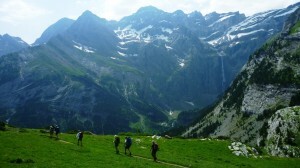 If you only come once to the Pyrenees for a trek then this is the one to do! The ultimate take it all in on both sides of the Pyrenees! Starting with the Gaube Valley above Cauterets in the heart of the French Pyrenees National Park we then drop into Spain, discover Torla, head up the Ordesa Canyon via a balcony path, walk through the Breche de Roland back into France and spend our last day walking around the Gavarnie Cirque; includes both the French Pyrenees and Spanish Ordesa National Parks (and of course the Mont Perdu World Heritage Area).